I turned 27 yesterday. I have a lot of feelings about it. On one hand... WHO in their right mind allowed me to be this old, and when do I officially become a grown up? Because I don't feel like it. On the other hand, I got ID'd when I tried to buy a 5-hour-energy a couple weeks ago. You have to be 18 to buy them. So there's that. 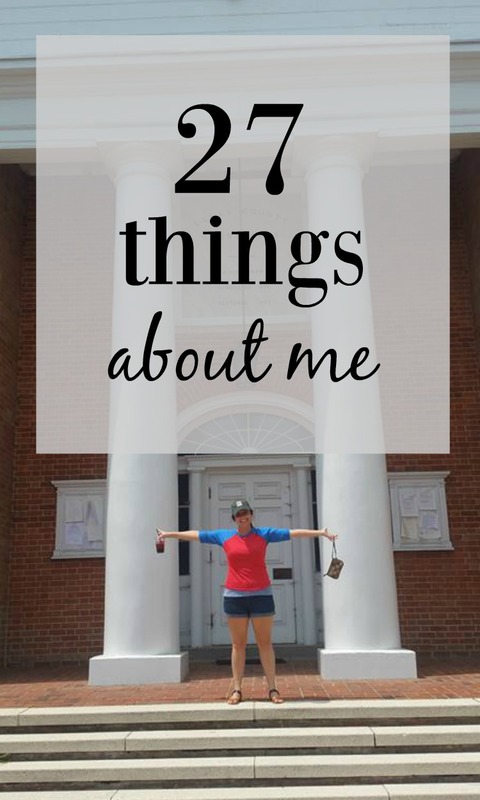 I thought it would be fun to share 27 different facts about me and quirks that I have. So that you can get to know me blogger (hi to the newbies out there! ), and also because it's Monday (riding the struggle bus, y'all). 1. The realization that I am now 27, and am a full fledged adult is really weird to me. Why doesn't adulthood come with a manual? Will I ever feel like a REAL adult, or is REAL ADULTING just this game of pretending that you know what you're doing? 2. On the other side of that coin, I am a full-fledged grandma. And proud of it. I would rather stay in, wear some jammies, cuddle with my cat and go to bed early ANY DAY than go out. Yeah, that's fun too, but not as fun as Netflix. 4. I love to have my nails painted, but once they chip, I can't stand it and pick it all off. For this reason, I hardly ever paint my nails. 5. I love plants. We have never had a great space to grow things, but right now I have 5 plants growing (and flourishing) in my office. 6. I'm not a really big TV person. I like to think that I can be devoted to shows, but I can't. I binge watch stuff on Netflix, and then I'm done with it. 7. I love the feeling of checking off something from your to-do list. I'm a huge list person, and I don't feel like I've accomplished anything for the day unless it is written down. 8. Dave and I adopted a kitten in October, and I've realized how big of a crazy cat lady I am. I just bought some mittens with cats, and I probably send my mom 41653644 cat pictures a day. I just love our Ruby! 9. I have a weird addiction to selling our old stuff on Craigslist or Facebook. Once I start listing things, I just want to find more to sell! 10. I love to travel, but we certainly don't do enough of it. My favorite way to travel is to drive, and explore all the fun things along the way. 11. My go-to order at Starbucks right now is a Grande Caffe Latte with Cinnamon. 12. Using a paper planner is an absolute must. I am getting ready to start my third Day Designer, and I don't know if I can switch it up at this point. I'm not someone who decorates their planner, though I love looking at layouts on Instagram. It's all pen and pencil for this girl. 13. My favorite fruit is pineapple. #bloglife. Not really, I've just always really liked it. 14. I really like to donate blood as often as I can. The phone calls from the Red Cross do get annoying, but it is SUCH an easy thing to do and is such a help to the community. 15. I believe that leggings ARE pants, but are such that you should wear a longer type shirt over them. Most of all, wear what you like and feel comfortable in! 16. I love to learn! I always try to take webinars and have even started using Lynda.com to take some classes. In January, I am starting my MBA in Sports, Arts, and Entertainment Management, and I am SO EXCITED. 17. I drink a good 3-4 cups of coffee on weekdays. Around 2 on weekends. I prefer my coffee with a good amount of cream but no sugar. Also, I have a really weird love for powder creamer, which is just weird. 18. The chore that I hate doing the most is laundry. Part of it is because it has to be lugged all the way down 3 floors to the basement, and then it costs quarters right now. Maybe this will be different once we have our own washer/dryer in our home. 19. I consider myself both a saver and a spender. I love to save money, and frequently tell myself no to things that I "don't really need," but I also want what I want. I have a full Amazon wishlist of things that I want, but will probably only buy one or two of them. 20. My favorite color is purple, but my favorite colors to wear are navy and emerald green. I love me some jewel tones. 21. Personalized things are my favorite ever. Slap a monogram or my name on it, and I don't care what it is, it's my new favorite. I purchased a return address stamp recently, and I am obsessed with it. 22. I'm seriously concerned about the cold and snow this year. We didn't see any really cold weather for the entire 4 years we lived in Norfolk. Now that we are in Pittsburgh, I actually needed to buy a winter coat! 23. The two things that I can cook REALLY well (if you call it cooking...), are butter noodles with cheese, and avocado toast. We eat avocado toast probably three times a week for different meals, and butter noodles once a week. Otherwise, I have to follow recipes pretty strictly. 24. If I was rich, I would subscribe to every subscription box out there. I currently get an Ipsy bag, but I would try all of them. I love getting mail, and I especially love trying new stuff. See #19. 25. I probably wear a dress or skirt to work 4 out of 5 days. I just feel more comfortable in that. This is despite the fact that when I was young I REFUSED to wear dresses and skirts ever. 26. Ice Cream is the best dessert ever. I could eat it any day, anytime, no matter how full I am. I love it so much that we served it at our wedding. 27. I can't think of anything else really, but if you are at the end of this list, we just became BFFs. Thank you always for reading, my friends!